I have had a longstanding interest in science public engagement being involved in a range of activities. 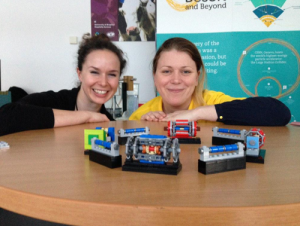 I work with the widening participation team at the University of Sussex to run physics workshops for young people to engage them with physics and research. I have been the outreach co-coordinator for the ATLAS experiment since 2014, working to communicate the success of ATLAS and provide educational resources to the public, students and teachers. In 2015 I won the European Physical Society (EPS) Outreach Prize, for outstanding outreach achievement in HEP. (ATLAS article, ICTP article). to outreach to those that have less access to scientific research, in particular young people from groups poorly represented in the scientific field. As ATLAS outreach co-coordinator, my key contribution has been to develop the ATLAS Open Data project (note), and I run the communications team. You can visit our ATLAS Public Website, check out our Resources. I engage with young people from low represented groups, working with Widening Participation team at the University of Sussex in the local area, I also with h igh schools in Norfolk where I grew up. 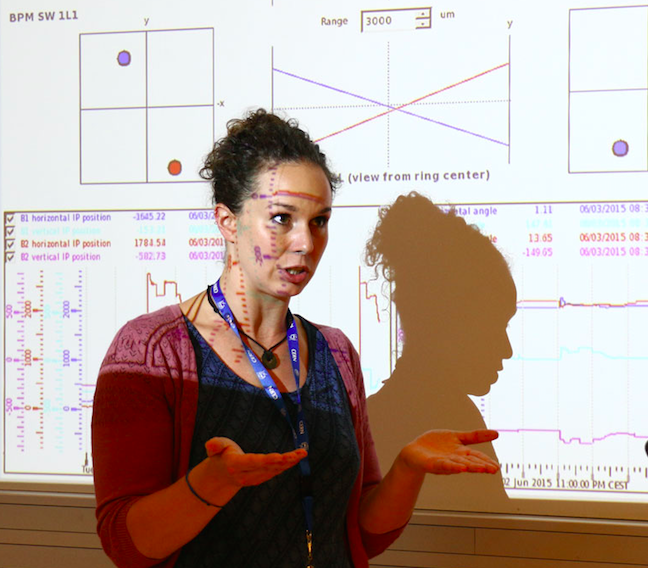 I organise particle physics workshops and masterclasses worldwide for under/post graduate students (such as at the African School of Physics, and ICTP Summer Schools), and also for high school students including as part of the international masterclasses. I have been involved in various science festivals showcasing particle physics and ATLAS is particular, such as at the Royal Society Summer Exhibition, and the Brighton Science Festival. “Exploring the mysteries of the Universe”, Guest Lecturer at the International Conference of Physics Students, Helsinki, August 2018. “An Introduction to Particle Physics”, CERN International teachers program, CERN, August 2017. “Understanding the Universe with ATLAS”, Keynote Speaker, Moogfest, Durham, US, May 2017 (article). 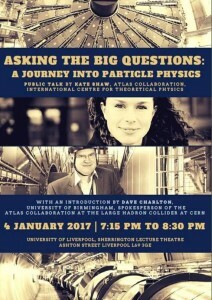 “Asking the Big Questions: A Journey into Particle Physics”, University Liverpool, January 2017. “Back to the Big Bang: ATLAS and the LHC”, as part of the Ireland for CERN campaign, Trinity College, Dublin, March 2014. “Discovery of the Higgs Boson with the ATLAS Detector at the LHC”, Birzeit University, Palestine, October 2013, (article). 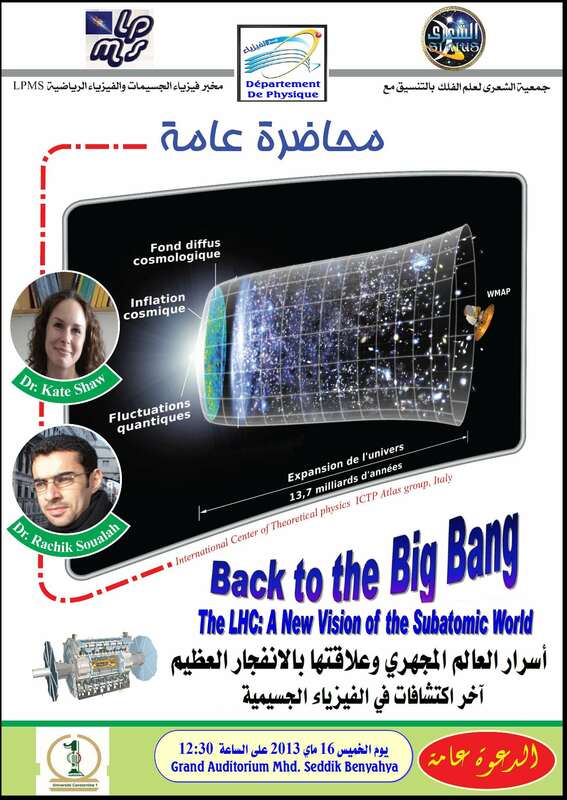 “Back to the Big Bang”, University of Constantine 1, Algeria, May 2013 (poster).